Everyone (usually) has a default place they would go to when they crave a particular comfort food. For me, it’s Senjyu in Bangsar Village whenever I crave a hearty bento. I’ve been a regular at the Bangsar outlet for more than 3 years because service has been good. It makes a difference when the staff knows your food preference. 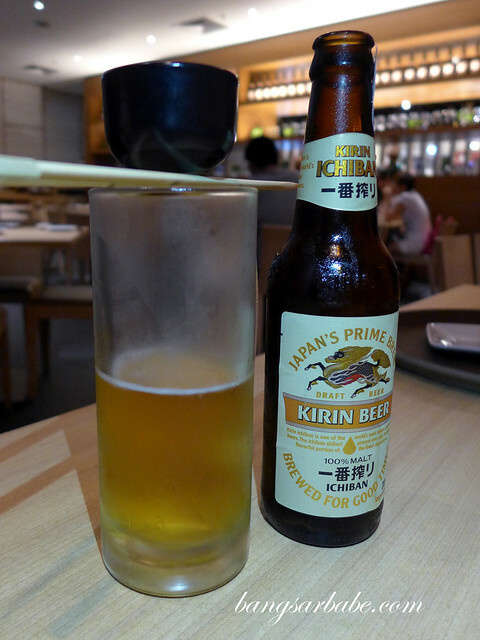 Senjyu Bomb (RM37.99) is a fusion of sake shot and Kirin beer – very fun and refreshing to drink. 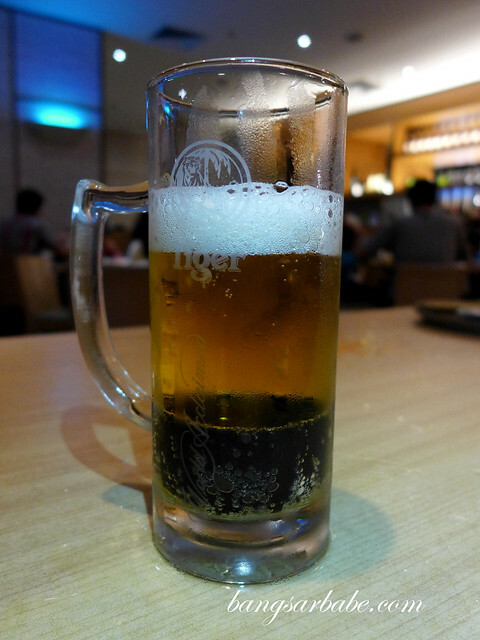 A note of caution though; stick to a glass or two if you’re a lightweight drinker. 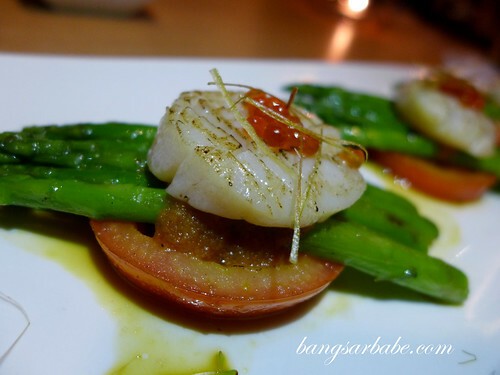 The Hotate Canapé (RM39.99) features pan seared Hokkaido scallops, on a bed of asparagus and sliced tomato. 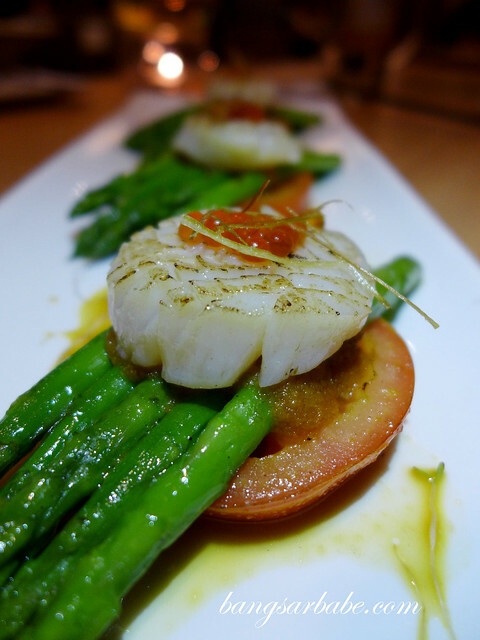 The scallops were sweet and succulent, and flavoured with roe and apple sauce. 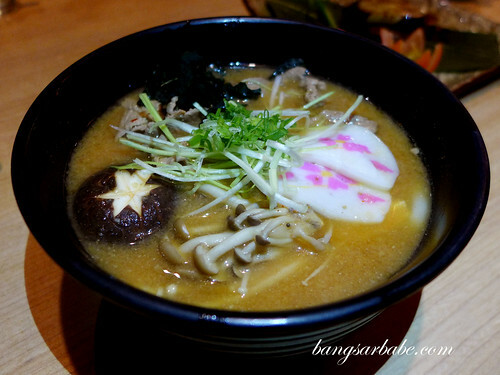 Iso Moriawase (RM77.99) is good to be shared between 3 to 4 pax. 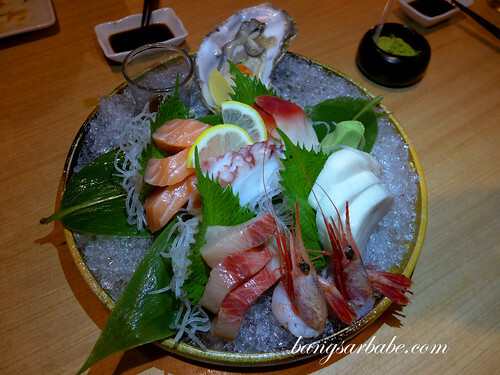 This pretty platter comprise fresh raw oyster, yellowtail, salmon, octopus, sweet shrimp, butterfish and surf clam, air-flown twice a week to ensure freshness and quality. 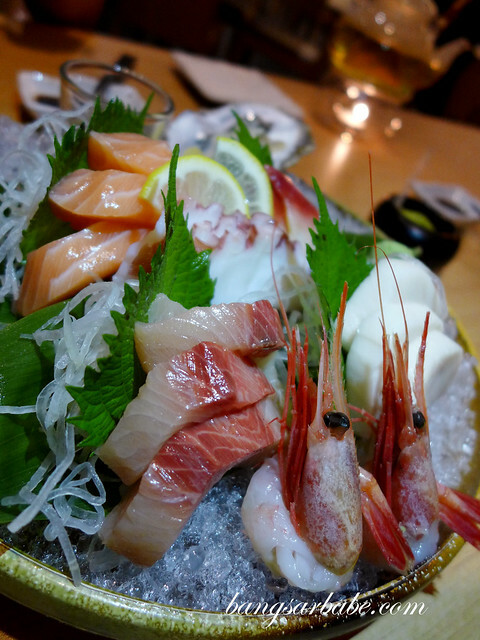 The sashimi slices were thick, flavourful and well worth the price tag. 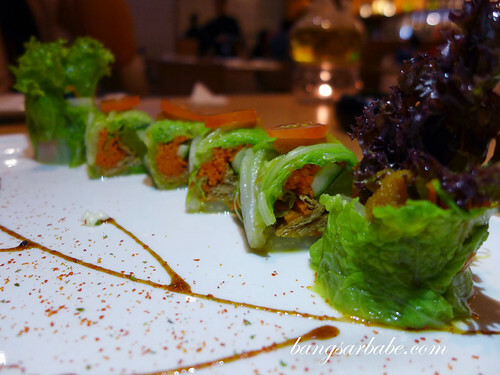 I rather enjoyed with Aburi Sushi Moriawase (RM41.99), Senjyu’s signature selection of handmade sushi topped with wagyu beef, scallop, yellowtail, tuna and salmon. 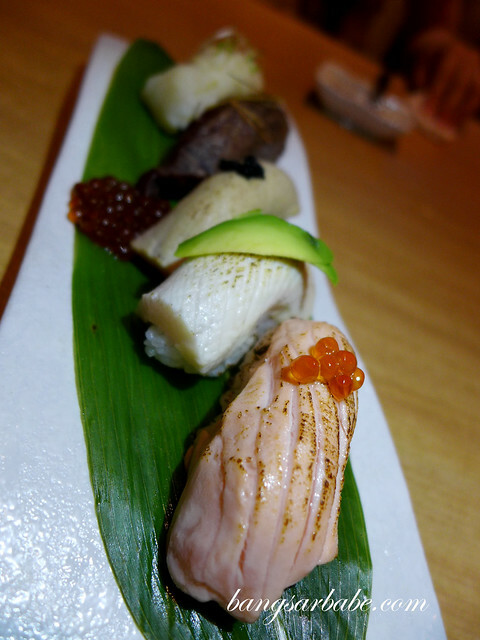 Of the five, I enjoyed the salmon and scallop best. Both had a buttery texture and a smoky-sweet flavour from the torching. 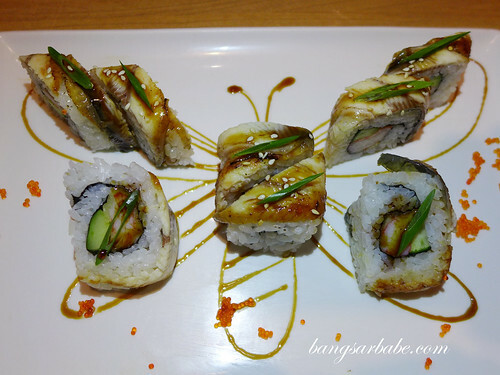 The Butterfly Maki (RM59.99) is plated to look like one. 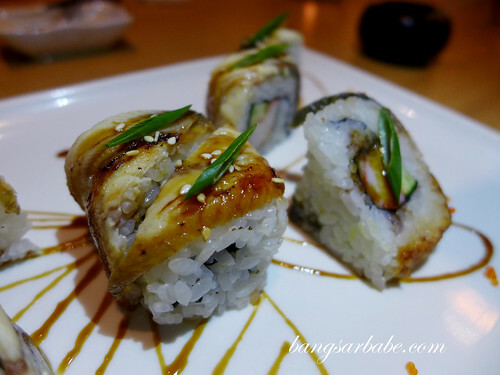 This was a tasty combination of unagi slices and tempura crabstick with sweet teriyaki sauce. 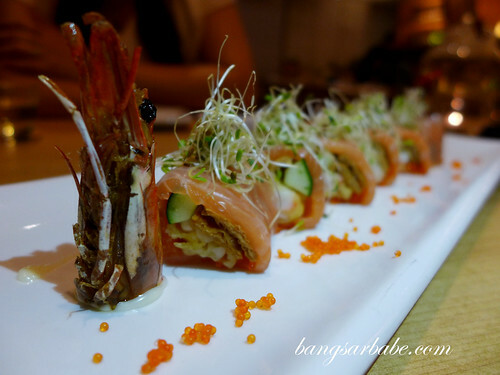 I really enjoyed the Red Dragon Maki (RM29.99), a beautiful composition of king prawn, flying fish roe, sweet beancurd and raw salmon slices. This was sweet, savoury and creamy in one bite. Delicious with several dashes of wasabi and shoyu. 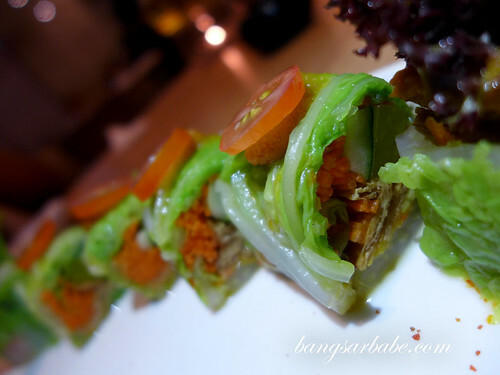 Yasai Maki (RM17.99) is a healthy (and vegetarian) option of fresh vegetables and sweet beancurd in lettuce. 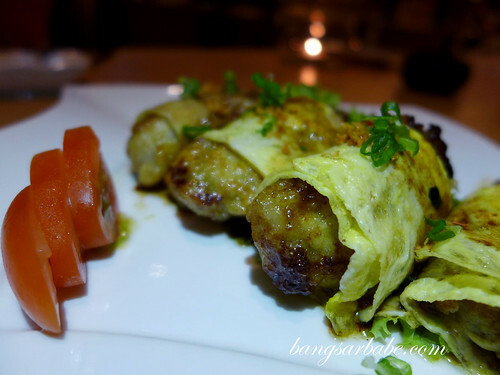 No rice is used for this so it’s essentially a vegetable wrap. 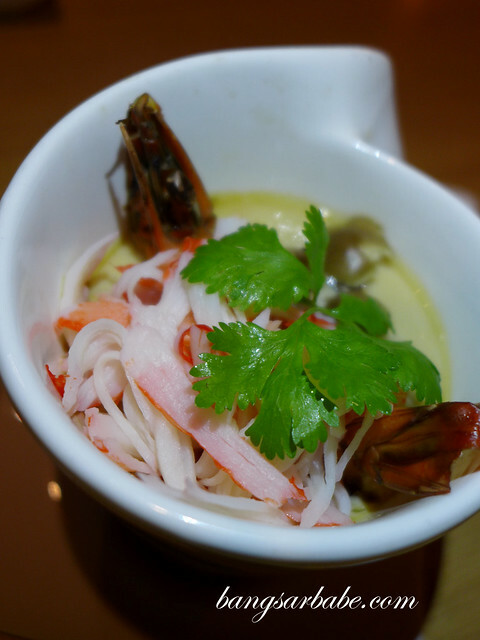 At Senjyu, the chawanmushi is made to order so expect to wait a bit for the Kaisen Chawanmushi (RM14.99), a luxe version of steamed egg custard with giant prawn, chicken, crabstick and mushroom. Good stuff! 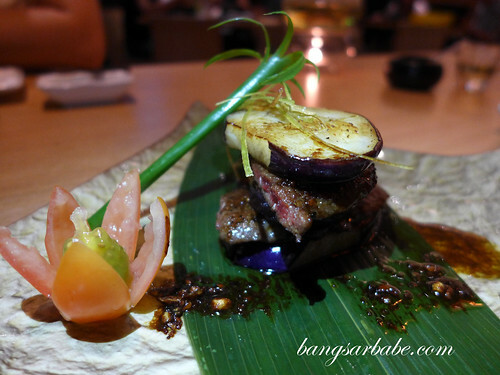 Gyu Hasami Yaki (RM25.99) is a clever fusion of grilled beef slices and eggplant, bound together with teriyaki sauce. 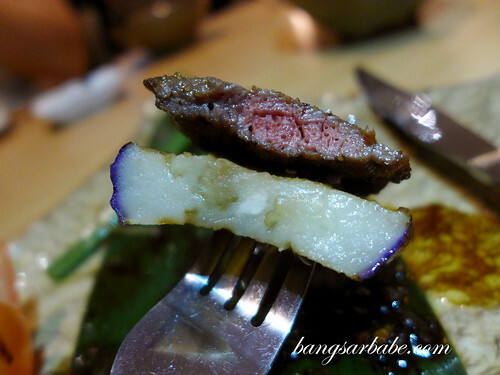 The beef slices were cooked till tender and paired nicely with the eggplant layers. Even better was the Kaki Roll (RM22.99), a tasty parcel of oyster and mushroom, wrapped in egg omelette. I’m an oyster lover so this is my kind of dish. Shake Kabuto Nitsuke (RM27.99) was quite decent, albeit not photogenic. 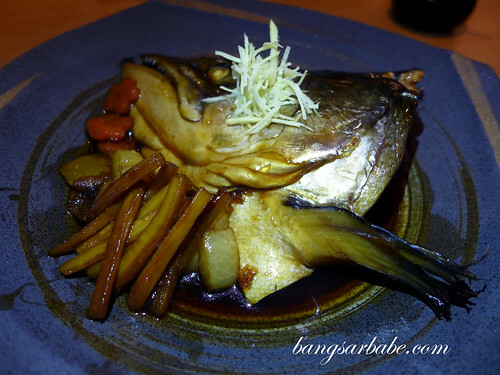 Nitsuke sauce is used to braise the salmon head so the end result was a fragrant and saucy dish that would go nicely with rice. I’m so pleased they decided to keep my favourite dish – Gyu Kimchee Udon (RM27.99). 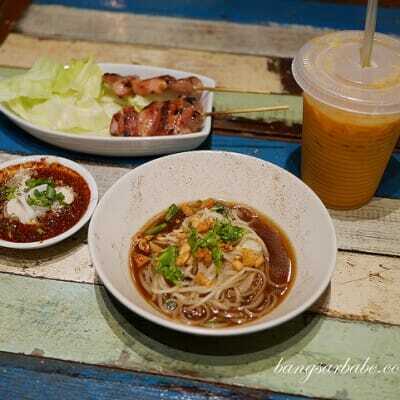 The only difference is, you get to choose your noodles to go with the beef kimchi soup. 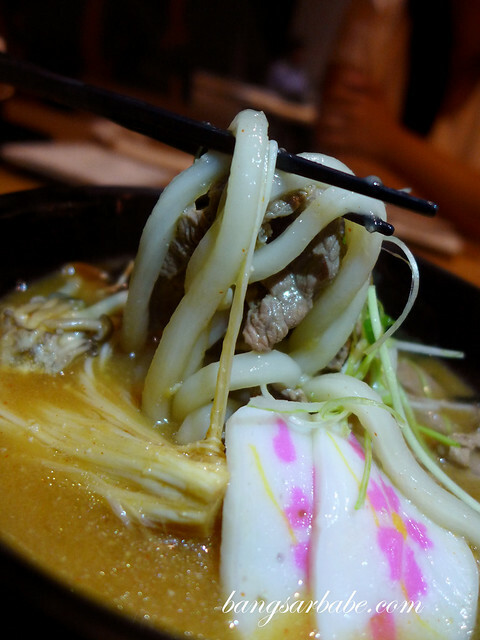 While this more of a Korean thing, I like the idea of having udon with kimchi soup. Shiratama Zenzai (RM7.99) comprised Japanese rice cakes with black sesame filling in red bean soup. I found the soup a tad sweet for my liking but the rice cakes were soft, chewy and generously filled. 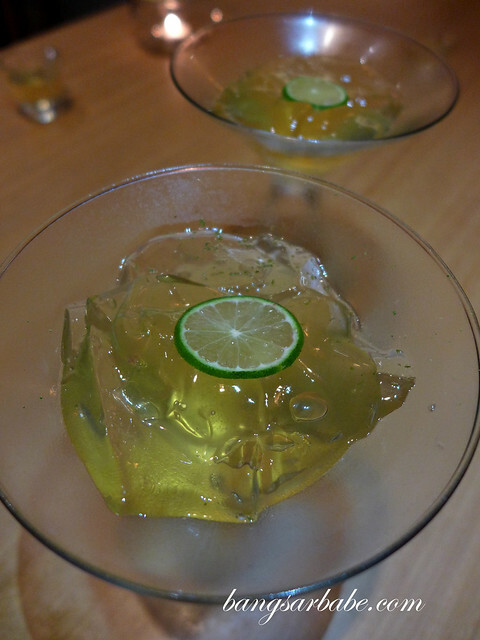 Lime Jelly (RM7.99) could have done with more lime. This was rather mild, with faint hints of lime towards the end. 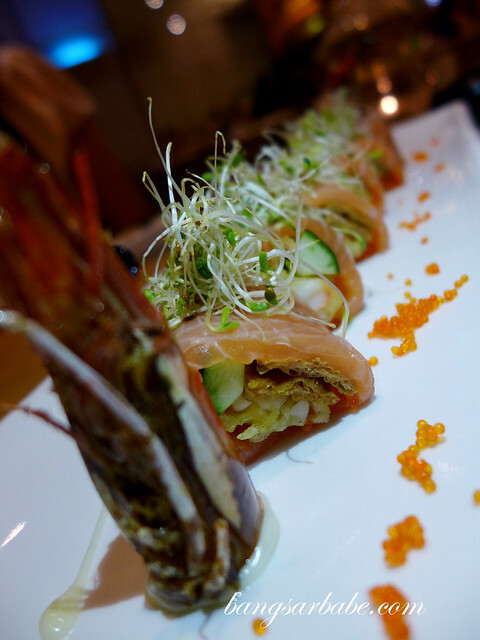 Verdict: Try the kaki roll, seafood chawanmushi and assorted sushi!